Karate literally means “empty hand” and karate-do “the way of the empty hand” which is a method of fighting without the use of weapons. Karate was developed on islands of Okinawa, the main island of the Ryu Kyu archipelago, which lies in the east China Sea between China and Japan. In 1609 a newly unified Japan invaded Okinawa and crushed all resistance. The Japanese victors then imposed a ban on all but their own warrior elite on the carrying of weapons. As a result the people of the island developed a system of unarmed fighting from which present day Karate has evolved. Alongside the practice of unarmed fighting skills, the people of Okinawa perfected various weapon systems based on the combative use of everyday implements such as rice fails, grind stone handles and sickles. Even the humble walking staff became a deadly weapon in the hands of an expert. All of these systems have survived to the present day and are practised in Dojos (training halls) throughout the world. Modern Karate is made up of many styles, which stem from their “hard” and “flexible” schools of origin. The main styles practised today are Shotokan, Goju Ryu, Wado Ryu and Shukokai although many more “splinter” groups have sprung up based to some degree on the aforementioned styles. 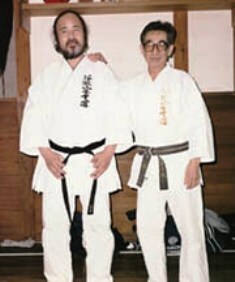 Shukokai was founded after the Second World War by Master Tani, who resided in Kobi City, Japan. Master Tani sought to perfect his style by studying the mechanics of the human body and developed techniques that can be delivered with maximum efficiency. The theories behind Shukokai are somewhat complex and it takes a lifetime of study to truly understand the art. It is a system of combat that seeks perfection and therefore demands continuous study.